Shirts, sweatshirts, and jackets are royal blue with three car midget action drawing on back, ACOT logo on left front. Jackets run a bit small for size. Available at the ACOT tent at our meets. Contact ACOTfor pricing on the following: ACOT patch, Lapel pin, Cap (new design in 2016, nice), T-Shirt, Golf Shirt, Sweatshirt, Jacket, ACOT Video "The golden Age of Racing" (one hour of running time). Edmunds midget 1983, aluminum body by Devine, fresh Autocraft 110 VW by Seymour, extra tires, wheels and gears. includes single axel trailer. Excellent condition. $9,500 or best offer. Gertler Midget. 1947 Ford Falcon power. Extra tires, wheels and gears. Good condition $14,000 or best offer. 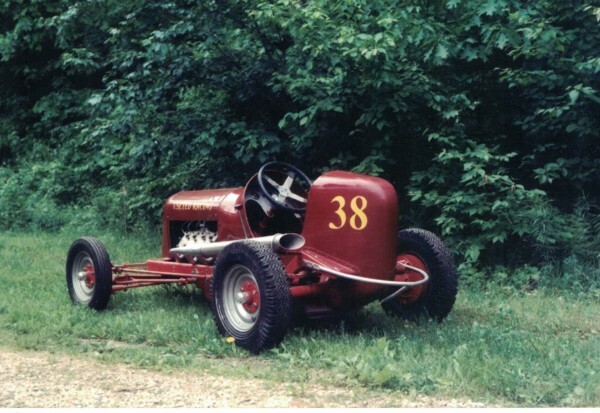 Kurtis Kraft Midget 1950. Chevy II (Iron Duke) power. Former Joe Sukup #35 with history. Extra asphalt and dirt tires, wheels and gears. Two side draft Corvette carburetors, enclosed trailer and winch. Excellent condition. 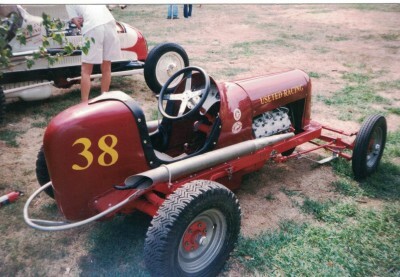 Gimple Roadster 1960s Three quarter midget. Crosley power. Ex Bob Ciccon car. In running condition. $6,900. Stewart three quarter midget. Fuel injected Honda power. Very good condition. $9,800 or trade. LLoyd sprint car with driven cage and wing. 350 chevy power. Bill Yodock Sprinter driven by Steve Yodock. AACA documented race car. Raced at Williams Grove, Salem, Bedford, and Port Royal PA, Hagerstown MD, Eldora OH, and Syracuse NY. The Yodocks ran the sprinter with the World of Outlaws from 1980 through 1986. Car is in good unrestored condition with original graphics. Pictures available on request, $10,500. Midget wheels. Weld aluminum (3) 13x10 and (6) 13x7. Various offsets. Also Halibrand vintage (5) 12 inch with windows and a set of (4) 12 inch full dish wheels. All $90 each. Call John 516 822 3108 or email johna919@aol.com. VW engine parts, Autocraft cylinder barrels and forged pistons 94MM, $275. Okrasa crankshaft 82 MM stroke with 4 Porsche 912 rods $800. 1989 Gambler Sprint Car, small block Chevy engine. Rebuilt fuel injection, 3 sets wheels and tires both dirt and asphalt. Five (5) sets of gears, Winter rear end, spare rear end. Turnkey car. $10,500. 215 cu Aluminum V8, Olds F-85 Engine, w/ vintage speed equipment: Wilson race cam, Crane valve train, AFB, electronic ignition, Olds, Chevy, and Ford trans adapters, aluminum flywheel, header kit, misc. spares and more, $1500. Inline 6 cyl. flathead Ford motor, complete, less the carburetor. Best offer. 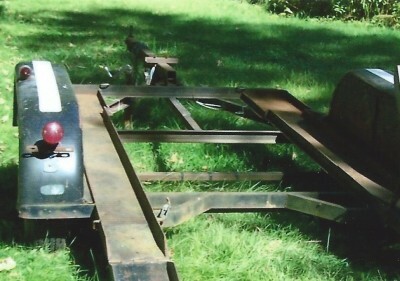 Open trailer, overall width of 7' 3'', with 68'' between fenders. 43'' between ramps, ramps 135'' long. Two axle wheels with electric brakes. 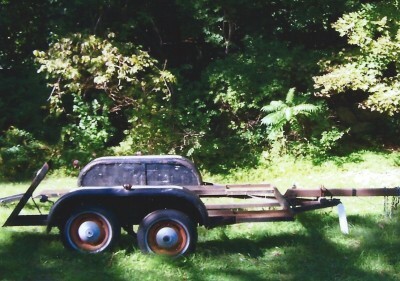 Trailer built for 'Basement Bessie' which has been on display at the Indy museum . $750 or best offer. Edmunds midgets wanted for the registry. Stop by the website or call me to get your car registered, all years. Brian at 267 516 0305 or bwatson@Edmundsmidgetregistry.com. Vintage Edmunds and Autocraft parts. Accumulating parts for project cars friends are building. Brian 267 516 0305 or bwatson@Ebmundsmidgetregestry.com. Year books for racing seasons 1983-1992. The year we are in most need is the 1983 racing season which will be in the 1984 yearbook. Will pay top dollar. ARDC yearbooks- all years. Call or email with what years you have for sale, will pay top dollar. I am trying to locate the #17 Blue Midget V8 60 Rail job. I sold it in 1999 to Jim Dooley, from Old Bridge, NJ. Any information would be appreciated. Information Wanted - Would the person who contacted one our new members, Norman Guay, about his racing career, please contact me. Norm raced in the 1950's -1960's. We are compiling Norm's history. Carburetors repaired, rebuilt. Stromberg, Ford, Holly. Also, flathead Ford distributors rebuilt. John Cahill 518 266 9886. Paint and body work, fiberglass repair, fabricating and refinishing.